WASHINGTON — The Capital Bikeshare program is easing D.C.’s traffic congestion, a new study suggests. “The introduction of a Capital Bike Share dock reduced traffic congestion by about 2 to 3 percent in its immediate area,” said Casey J. Wichman, fellow at think tank Resources for the Future. Wichman co-authored the study, which examined roads in D.C. that featured bike share stations. The streets were studied between 2010 and 2012 during the spring and fall months. The study compared individual census block groups with similar demographic characteristics and traffic congestion patterns, Wichman said. The roads that benefited the most had speed limits of 35 miles-per-hour or more. The study also found increased congestion on streets adjacent to those with bike stations. “It could be that car drivers took alternate routes to avoid bicycle traffic,” Wichman said. The Capital Bike Share program has more than 300 bike docks in the D.C. area, with more than 100 of those in the District. 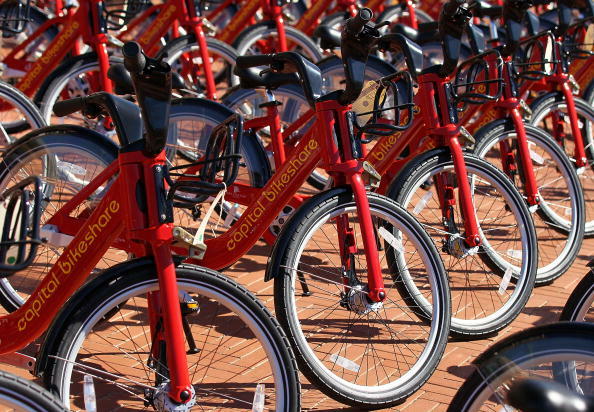 The program will undergo a $3.5 million expansion to put more stations and bikes in the D.C. area.